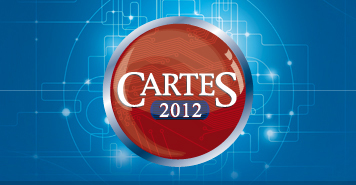 Mobile and near field communication technologies were put in the spotlight as the winners of the 2012 SESAMES awards at the CARTES 2012 Exhibition and Conference. Six of 11 winners were NFC technologies while two had technologies that were mobile security related. Morpho, Infineon and Gemalto were winners that had technology dealing with card technology. NXP Semiconductors was the only company to win multiple awards with two. NXP’s PN547 improves performance over previous iterations of its NFC radio controller in performance and offers doubled radio frequency range, a smaller footprint, an improvement in wireless data throughput and a 50% lower power consumption. It also delivers interoperability working with any contactless reader and NFC tag, supporting revolutionary mobile user experiences. Saturnus is a cloud security application that gives users secure access to their data anytime, anywhere. It is a secure cloud application that offers security based on Hardware Intrinsic Security. It runs on mobile devices and enables corporate customers to tap into the business opportunities that the cloud presents. This technology integrates a secure element and an NFC booster with antenna into a SIM card that turns any handset into NFC device. It is designed to be a low cost alternative to NFC handsets and it enables mobile network operators to roll out contactless mobile payment services easily with control due to its handset-independent nature that simplifies the ecosystem of the services. Morpho’s EMV Pro Digit no only provides payments but also enables consumer’s access to strong, multi-factor authentication, digital signature services with post-issuance activation and management. Morpho Digit is a bridge towards secure online services and e-ID on payment smart cards. Infineon’s SLS 32TLC100 is a security controller that is compliant with CIPURSE V2 and features Mifare compatibility. It is a migration product to upgrade existing transport solutions to more advanced security based on AES 128. The SLS 32TLC100 is based on Infineon’s SLE 7x SOLID FLASH family used in many applications. Akami suite is a front-end platform to port and distribute NFC applications. Its widget-based architecture enables fast and cross OS-platform deployment of NFC services. The white-branded suite includes a mobile client (NFC wallet), a widget system SDK, application servers, tag management and an app store for end-users. Cubic’s mobile point-of-sales application combines NFC technology with contactless e-Ticketing for public transport. Passengers can reload their smart cards “on-the-go” while at the same time transit agencies could save costs on rolling out stationary ticket vending machines. An NFC payment wallet that virtualizes up to 10 payment cards, including both Visa and MasterCard, and enables users to pay on contactless terminals anywhere in the world. This wallet also can possibly be extended to other applications, such as loyalty. G&D Wallet, SmartTrust Portigo is a horizontal wallet solution that goes beyond NFC. It enables banks or mobile network operators to provide their customers with a platform for all their mobile services, for example, NFC, secure mobile banking, loyalty. PrintPixel is an algorithm-based solution to personalize a blank ID document with a color photo while keeping the same security, durability and cost efficiency of laser engraving technology. Special layers react under lasers to irreversibly create white and black pixels and cover a 3-color registered pattern, revealing a color photo. RCDevs specializes in two-factor solutions. The OpenOTP/TiQR Server is an enterprise solution for securing Web access, VPN, Citrix, Microsoft, Unix with OTP Standards & QR Login. It supports a variety of technologies including Hard & Soft Tokens, SMS, Email, Yubikey, QRCode Scan, Federation with OpenID & SAML.